Ayala is a small negiciant in the Aÿ in the Vallée de la Marne. They were founded in 1860 by Edmond de Ayala who received vineyards and a chateau when he married as part of his dowry (in contrast, I received nothing but hassle when I married, not even a goat or two!). Its past has been very tumultuous, including the destruction of the chateau during the Champagne Riots of 1911 and rebuilding in 1913, being sold at auction during the Great Depression, and two sales within the last decade! What has remained constant is the winemaking, with Nicolas Klym as chef de caves for over 3 decades. Currently Ayala depends on purchased grapes for all its needs; they own no vineyards. This is of course bad in many ways and also good in some ways. It does allow Nicolas to review and review Ayala's portfolio of wines as needed. In particular, he and Ayala have taken good advantage of the trend towards zero and lower dosage wines. 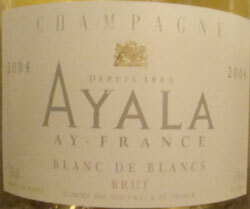 Ayala is currently owned by Bollinger, but their style is extremely different. Bollinger makes wines that are "dry, powerful, and toasty." Although Ayala wines are also quite dry, they are subtle and elegant. Brut Majeur NV - 45% Pinot Noir, 30% Chardonnay, and 25% Pinot Meunier. Their basic NV. They use no more than 20% reserve wines. Rich Majeur NV - A demi-sec version of the Brut Majeur, with 35grams.Liter of dosage. which means sweet! Brut Majeur Rose - 51% Chardonnay, 39% Pinot Noir, and 10% Pinot Meunier. A pretty and delicate wine. Cuvée Rosé Nature NV - Mostly Chardonnay, with zero dosage. It's 53% Chardonnay and 47% Pinot Noir and big enough reportedly to pair with lamb! Brut Zero Dosage "Nature" - A zero dosage wine very close in composition to their Brut Majeur. A subtle and understated wines (as all Ayala's are to some extent). Blanc de Blancs Vintage - Made from Premier Cru grapes primarily from Mesnil and also Cramant, and Chouilly. Dosage usually around 7-8 grams/liter. Millésimé - Their basic vintage wine, 80% Grand Cru Pinot Noir and 20% Grand Cru Chardonnay. A full bodied wine, no surprise, as it's mainly Pinot Noir. Cuvee Perle d’Ayala Nature - No surprise, the Zero Dosage version of Perle d’Ayala. Ayala Blanc de Blancs Brut 2004Tasting Note: - January, 2013 - rated B+/A- This really needs to warm quite a bit from refrigerator temp and breath to start shining! A very light color and plenty of bubbles. On the nose an immediate impression of freshly cut apples and minerals. A pleasant sandstone and chalk. Orange citrus as it warms and breathes. A slightly herbaceous nose. Quite delicate and nice on the palate. A core of delicate citrus with lime dominant as well as some orange citrus and apple as well. Slight creaminess. As it warms, a slight touch of pineapple and definitely red apple - Macintosh maybe?